Environmental AND health hazard! Great take on the prompt with realist dialogue. To the Mother-Moth-Ship. Funny one. Ahahahaha. This cracked me up. The thing just popped up right in the middle of there course! 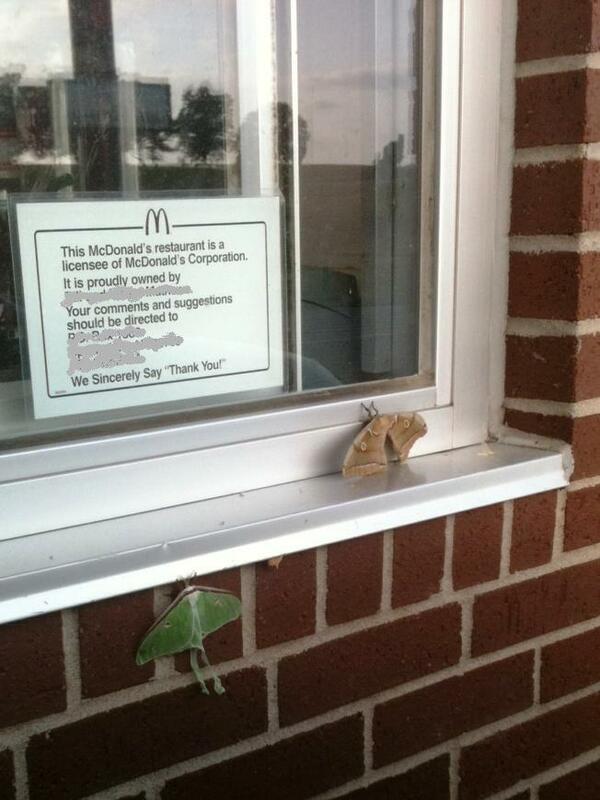 Pesky McDonalds. Loved it. Fantastic dialogue, totally believable and witty. Nicely done! Hi Erin, If McD’s is the first thing the aliens see, well you know what they say about first impressions. Very creative and fun reading. Thanks for reading and commenting on my story. Great story. A nice twist on a simple picture. thanks for the nice comment on mine, Erin. Interesting approach to the photograph. Sci-fi moths. LOL Great tale, Erin. I loved the clipped conversation. Really brought me into the story. Pretty funny, Erin, and nicely done in dialogue. Good one. My moths were air/space ships too. Perhaps there is a lesson here. Too many McDonald franchises spreading out all over the world. When you see those “Golden Arches”…either duck or blow them to pieces. Roger. Loved it. Very funny too. FANTASTIC! Great way to start the morning. The drinking line was priceless. I can claim no such brilliance, but here’s my attempt. So glad I could start your day off right. Cute and realistic sounding. I could just as well have been listening in on the radios. Thanks – it was fun to write. The green moth looks so much like something from a sci fi movie, it just felt like that was the direction to go with it. Thanks for the follow. I enjoyed your story, especially the Moth-er ship. Thinking of it is one thing. Placing it in a story as imaginative as your and making us smile is quite another.